Vytru has been always focusing its effort to provide companies that are using Microsoft Lync with smart applications to capitalize the benefits of Lync and to increase company’s productivity. These applications were developed by a very dedicated, powerful and responsible team who made a commitment to help Lync community and never hesitate to provide companies with any solution that gives users the best Lync experience they could ever have. Vytru managed to deliver two powerful, important and carefully-developed applications for Lync to complete needs that companies might have with Lync, so here we have Lync Contacts Manger that allows a central management for contact lists as far as creating, updating and deleting contact lists once and for all users in the organization and Skype gateway that helps organizations who are deploying Lync to make and receive call by integrating your Lync infrastructure with "Skype Connect". Creative tool that centrally and automatically manages Skype for business/Lync contact lists for all users from one location. 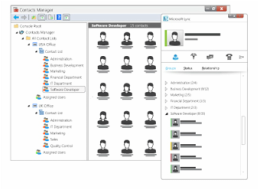 The consistent, updated, and organized contact lists will increase Lync user adoption and productivity. Web Chat Widget for Microsoft Lync/Skype for business helps you to connect with your anonymous website visitors from your Microsoft Lync/Skype for Business client from anywhere. Engage with your website visitors and deliver a better customer experience with IM, Audio, Video, and Screen Sharing. Not only that, track your visitors and know where they found, where they are, and what they are interested in. It integrates Lync infrastructure with "Skype Connect" service from Skype which enables any organization to take advantage of your Lync platform to communicate better with the world with a very cost-effective price.